I Went Zero Carb and My Total and LDL Cholesterol Went Really High! Is That Dangerous? No! In my 5 years of experience blogging on Low Carb, High Fat and Zero Carb diets I have seen a consistent pattern. what I regularly see is that a person’s weight, Hemoglobin A1c (a measurement of the average blood sugar for the last 90 days), Triglyceride levels, and C-Reactive Protein (a measurement of overall body inflammation) all go down while the beneficial HDL Cholesterol shoots up. But in most cases the “suspect” LDL and Total Cholesterols often go up, usually dramatically by current recommended standards. The next thing I hear is that an uncle who is a doctor or a cousin who is a nutritionist says “you have to go low fat, high fruit, high whole grains or you will soon have a heart attack. I would like to explain why in my opinion Total Cholesterols in the range of 200-400 mg/dl (5.172-10.34 mmol/l) and LDL Cholesterols in the range of 130-300 mg/dl (3.362-7.758 mmol/l) are quite healthy and normal. I plan to include all the scientific articles and charts I have collected over the years on the subject in case people would like to show it to their medical providers to start a conversation about the subject with their own medical provider. So a man who goes on a Low Carb, High Fat diet and optimizes HDL and Triglycerides can get a total decrease in heart risk of 5X and a woman can get a 9.5X risk reduction. However if our low carb dieter were to follow the advice to add back carbohydrate he would see his triglycerides rise. Here’s a quote from this article in the Journal of Nutrition: “When the content of dietary carbohydrate is elevated above the level typically consumed (>55% of energy), blood concentrations of triglycerides rise. This phenomenon, known as carbohydrate-induced hypertriglyceridemia, is paradoxical because the increase in dietary carbohydrate usually comes at the expense of dietary fat. Thus, when the content of the carbohydrate in the diet is increased, fat in the diet is reduced, but the content of fat (triglycerides) in the blood rises.” Also as carbohydrate intake increases HDL Cholesterol goes down. Here’s a quote from this article in the Journal of the American College of Nutrition: “there was an inverse association between percentage of calories from carbohydrate and HDL-C levels.” So by taking the advice to add back carbohydrate a person inevitably sees his HDL and Triglyceride levels reflecting a higher risk of heart disease. 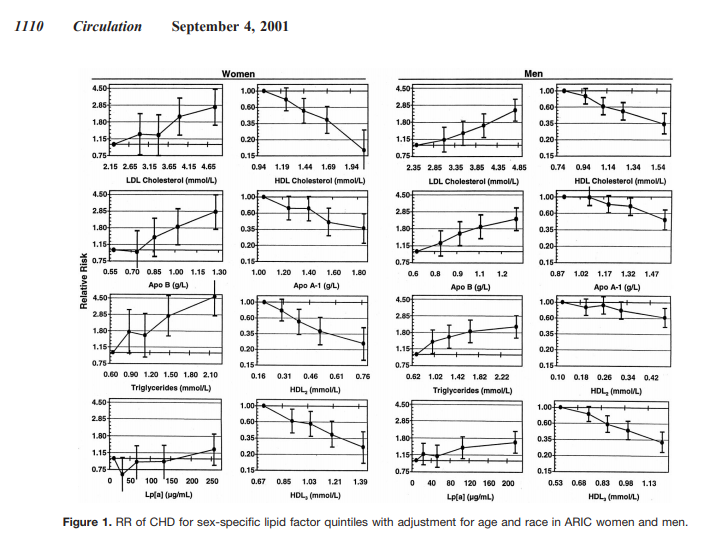 As for having a very high Cholesterol, I love this study of Japanese men in Hawaii where they measured their Cholesterol every year for 20 years and found that the higher the Cholesterol levels were the longer they lived. It obviously wasn’t the result they were looking for because here is a quote from their conclusion: “We have been unable to explain our results. These data cast doubt on the scientific justification for lowering cholesterol to very low concentrations (<4·65 mmol/L) in elderly people.” People who recommend low fat diets to lower Total and LDL Cholesterol have a lot of trouble explaining this study of 68,094 people who were 60 years of age and older published in the British Medical Journal recently which showed that the higher their LDL and total Cholesterol was, the less likely a person was to have a heart attack or Alzheimer’s and the longer he was likely to live. So I personally couldn’t imagine why anyone over 60 would consider lowering their LDL and total Cholesterol with a low fat diet in light of this study. I also believe that statin medications for people who have not already had a heart attack are counterproductive and that their use even in people who have already had a heart attack may not be the best approach. I have written about that in this post. ​Please note at $475,072 in general pay and $119,407 in research grants, the editors of the Journal of the American College of Cardiology that controls publication of articles on statin medications and the use of polyunsaturated cooking oils produced by agribusiness are recompensed quite handsomely. As a retired family medicine doctor who twice passed the board certification exam, the body of scientific evidence I have found clearly supports the points I have made above. I welcome anyone to challenge my positions point by point in the comments. I will not post comments that are vague, rambling and do not address a particular point I have made but I will certainly allow and comment on posts that address a particular point and include scientific evidence to support or refute it. If you would like to discuss this further or have other data, please join my Facebook Group “Zero Carb Doc”, email me at ZeroCarbDoc@gmail.com or comment on this post. If you missed my last post called “How an All Meat Diet Can Reverse the Autoimmune Diseases Caused by Leaky Gut” you can view it by CLICKING HERE. My doctor told me to watch my fat intake because my LDL went up to 165, which raised my total cholesterol to 250. But my triglycerides went down to 45 amd my HDL went up to 85, making my ratio really good. So I’m thinking I can ignore her concern and advice?? Ashley my Total and LDL Cholesterol are much higher than yours and I am delighted with them. Doctors are busy people and don’t have time to dig into journals and textbooks so most of the continuing education on nutrition they get (and they get very little in medical school) gets heavily influenced by pharmaceutical and agribusiness money. Selling statins is a multi-billion dollar industry. And if you cut fat, I assure you those wonderful HDL and Triglyceride numbers cutting your cardiac risk by 9 times will almost certain deteriorate. Thank you! We follow a LCHF lifestyle and my Total cholesterol is ‘high’ according to current recommendations. Your article reinforces my belief that we’re doing the best lifestyle programme. My husband is a newly diagnosed type 1.5 diabetic and after a year of LCHF eating, is metformin-free and virtually off his insulin. Again, my thanks for your clear explanation re the cholesterol debate! Excellent article! Thank you! Very timely. Obviously thoroughly researched and I appreciate the information from other medical sources that you always embed. That independent information correlates so convincingly with your comments, medical experience, and suggestions. Thanks Paul for your committment to educating in layman terms. Bobby, there are inherited conditions that predispose one having high triglyceride levels, perhaps you have one of these. Almost everyone who begins a low carb, high fat diet and follows it faithfully sees their triglycerides fall under 100 with just 2-3 weeks, often sooner. My last blood tests showed that my HDL went up and my Trigs were down from the previous one 18 mos before. However, my TC tripled and my LDL went sky high. My doctor wanted me on a statin immediately due to cardiac events within my immediate family. My #’s are TC 12.53 mmol (up from 5.56), Trigs 1.63 (down from 2.19), LDL 10.55 (Up from 3.64), HDL 1.24, (up from 0.93), Chol/HDl ratio 10.1. My Dr. told me he has never seen a ratio so high and is very concerned, although supportive of Keto. I did your formula “ratio of the triglycerides divided by the HDL Cholesterol”, mine is 1.314. I cannot determine if this is good or bad. 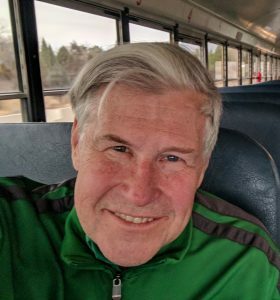 I am 9 months keto, all inflammatory markers are now within normal for the first time in decades. Can you please advise if I have to be worried about these ratio #’s. Thanks! Thank you Dr. Mabry. I reached my goal weight of 120 lbs a couple of months ago. I am 58 yrs old. I have lost a total of 97 lbs in the past year (3 mos on Weight Watchers, the rest on Keto). My BP also went up, although I did not agree to take the statin, I did agree to take the coversyl. In the past month, my BP finally came down (I am currently on my 4th refill). I tried to understand the information in the link but it’s information overload for me and I can’t process or understand it. I guess my question is, if my ratio of the tri/HDL is 1.314 mmol (50.733 mg/dL), am I at risk? Kel, congratulations on your amazing transformation! Your Cholesterol and HDL levels are almost the same as mine and I am think they are great based on all I know. I think pushing the Total Cholesterol/HDL which is basically a surrogate way of measuring LDL Cholesterol because even the drug companies realize that LDL Cholesterol which is not measured but calculated and may be bad or good as the large fluffy LDL is good, only the small dense LDL is bad. Well testing the Total Cholesterol/HDL ratio basically been driven by drug company money in their drive to put everybody in the world on a statin as since the ratio is driven by LDL so their statin medicines will make that ratio look better but would not help the Trig/HDL ratio. 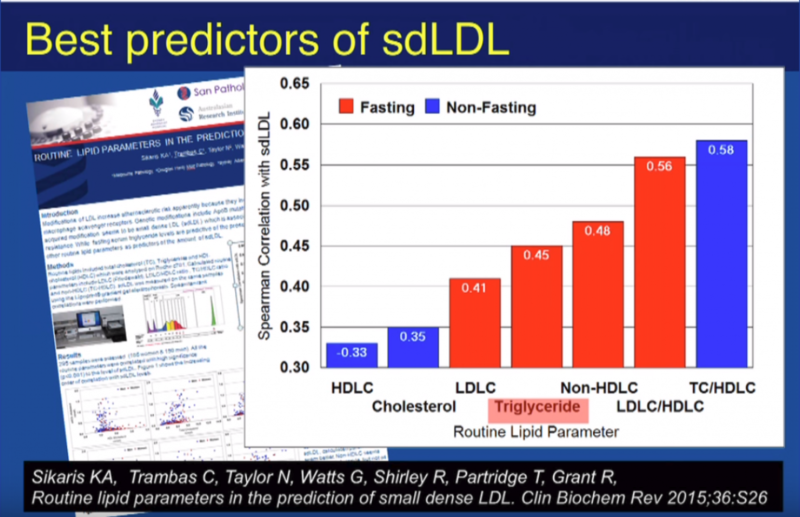 I think the triglyceride/HDL ratio is a much more sensitive measure but is not liked by most doctors because the low fat, high carb diets they recommend will make it get worse. So Happy to come across your article, my cholesterol is high because of the meat diet I’ve been on …did the ratio TRI/HDL = .589. Thank you for the education. I apologize Dr Mabry….my calculations were done on the European numbers and I just did the conversion and it turns out that I am at 1.345. Those numbers happened in 01/19. The previous number in October was 2.804. My A1C was 6.8 in October…I was not tested for A1C in January. If my TRI/HDL dropped dramatically, would my A1C also have dropped dramatically? I’m just wondering if I need to get retested…because of the significant drop…(ie testing error) Thanks again.